Despite the Egyptian government’s deployment of additional troops to its restless northern Sinai region, attacks by Islamist militants continue, and almost inevitably civilians are being caught in the violence. Last month, a suicide bomber rammed his car into a bus carrying off-duty soldiers, killing 10, including the civilian driver. Although no one claimed responsibility, the attack bore the hallmark of the al-Qaeda inspired militants the Egyptian army has been trying to suppress. The marginalized Sinai Peninsula has been unstable for years. Growing Islamist militancy announced itself with a string of sabotage strikes on gas pipelines to Israel in 2011, and attacks on security forces. After attackers killed 16 Egyptian soldiers at the border with Israel in August 2012, Israel allowed Egypt to send additional troops to the area, a measure usually forbidden by a peace agreement between both countries. A period of relative calm under former president Mohamed Morsi ended with his ousting in July, leading to a spike in violence. The government stepped up its military response after the attempted assassination of Interior Minister Mohamed Ibrahim in September. But the army has struggled to locate its enemy in Sinai - a combination of Egyptian or foreign jihadists and local Bedouin tribesmen with grievances. Army sweeps through some villages have been accused of killing and injuring civilians uninvolved in the insurgency. When 65-year-old Safa’a* saw an army patrol coming towards her home in the village of al-Moqata’a, south of al-Sheikh Zuwaid town, on 8 September, she refused to leave. According to relatives of the deceased, Safa’a was one of two people killed in al-Moqata’a during two days of military operations there in early September. The village would be targeted again and again in the following weeks. “We didn’t get a death certificate accusing the army because it would cause us trouble,” Aya said. Security sources told the media that these same operations led to the deaths of armed jihadists and the arrest of the “leader of al-Qaeda in Sinai”. An armed group in Sinai, al-Salafiya al-Jihadiya (Salafist Jihadism), accused the army of achieving nothing but the arbitrary killings of civilians. Egyptian authorities say they lost more than 100 police, soldiers and conscripts between July, when the insurgency in Sinai escalated, and October. Samir Ghattass, director of the Middle East Forum for Strategic Studies, puts that number at 124. In its months-long campaign in North Sinai, the army boasts of many deaths among “terrorists” (165 as of 14 November). According to David Barnett, of the Foundation for Defense of Democracies, a Washington-based think tank, monthly attacks by militants dropped from 104 in July to 23 in October, though they rose slightly in November. The army admits few, if any, civilian casualties. “We take great care of civilian lives,” Egyptian military spokesperson Colonel Ahmed Ali told IRIN. But some residents say they have paid a heavy price: civilian deaths; destruction of homes, property and livelihoods; displacement; and little hope for compensation. In addition to the two deaths in al-Moqata’a, a jihadist group reported seven civilians, including four children, were killed in al-Fitat Village, south of al-Sheikh Zuwaid, on 13 September, during military operations in the village. While residents of the area supported the claims, IRIN could not independently verify them. A local journalist, who requested anonymity for fear of repercussions by the army, told IRIN several people who were mistaken for militants by the army or police had been killed. They include two men killed in a taxi in al-Arish town; two people, including a child, killed at a checkpoint in al-Sheikh Zuwaid; and two people killed in al-Gora Square, also in al-Sheikh Zuwaid, during clashes between militants and security forces. One of the dead was Mostafa Nasser, 63. According to his son, Ali, Nasser had mixed up the time and left a pharmacy, located next to the police station in al-Sheikh Zuwaid, one hour past curfew. “The police pretend there was an attack on the police station, and eyewitnesses affirm there wasn’t. In any case, my father… had nothing to do with it,” Ali told IRIN. Nasser was shot and killed. “The governorate of al-Arish phoned me up to let me know there would be a compensation since his death was a mistake, but that I had to hold on,” Ali said. The government’s counter-insurgency operations have also resulted in some displacement, say families. 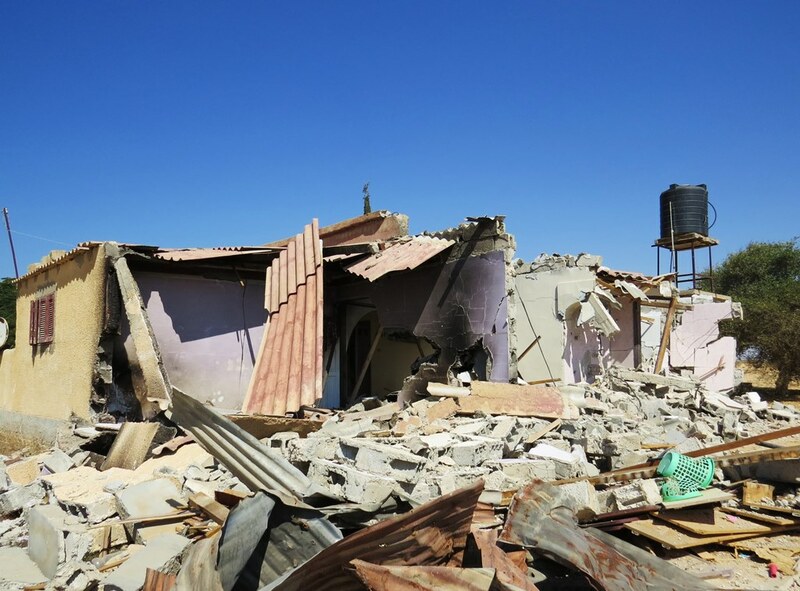 Sami*, a resident of Rafah, said he was forced to move in with relatives in al-Mehdiya Village, south of Rafah, at the beginning of September, after his home was destroyed by the army. He said nine families had fled al-Mehdiya; some left for the towns of al-Sheikh Zuwaid and al-Arish, others for the capital, Cairo. “Most of the people are not living in the village anymore,” he said in October. In any case, he said, he is unable to rebuild his home. Trade has stopped and an early curfew has limited the transport of construction materials. A few days after IRIN spoke to him, Sami’s relative’s home was also destroyed. Samia*, another villager, said her sister had resorted to living in a yard after her home was damaged, and that her cousin had fled to Cairo. According to Mohamed Abdullah, head of relief at the Egyptian Red Crescent, the number of civilians killed or injured in operations was “limited”. He told IRIN in November he was not aware of any major displacement in the area. The Red Crescent stood ready to provide tents, blankets or other aid, he said, but its branches in Sinai had not received requests for assistance. The governorate and the army, he added, were well-equipped to respond in cases of humanitarian need. Others acknowledge the human cost, but say the ends justify the means. While some villages of northeastern Sinai have not been touched by the counter-terrorism operations, others have been targeted several times, leading almost the entire male population to flee - at least while operations are ongoing. For example, when IRIN visited the village of al-Moqata’a, which has been raided three times, during the Eid holiday in October - a time when families usually gather to celebrate the feast - it was half empty, more than a month after major military operations in the village. Many homes were flattened to the ground. Others had large sections blown away, gaping holes in walls pockmarked by bullets, and signs of burning. And some houses, sitting beside the damaged ones, were untouched. One resident of the border town of Rafah said around 25 civilian houses had been destroyed in mid-October. IRIN also saw that many olive tree orchards, located next to destroyed houses, had been shaved to the ground. Olives are the main agricultural source of income for this part of Sinai, but militants have hidden in the trees lining the road to ambush army convoys. According to the authorities, “terrorists” are the only target of operations. But local residents in al-Mehdiya say the security forces attacked houses at random, including the homes of people who had no links to armed groups. IRIN spoke to five families who said their homes had been wrongfully targeted. They said they were not informed before the destruction of their homes and have received no word on compensation. Marwa* and her nine-year-old daughter barely had time to flee when the army attacked their home, located some 100m from that of a known militant. The girl was injured in the process: a piece of shrapnel entered her cheek. In many cases, the army does get its targeting right. Ansar Bayt al-Maqdis is a jihadist group that has taken credit for attacks on the North Sinai pipeline, on security forces in Sinai, on army “collaborators” and on the interior minister in Cairo. In al-Mehdiya, the home of Shadi el-Menai, said to be one of the founders of the group, has been flattened to the ground. But so, too, have the homes of all his family members. Indeed, some residents, like Khaled el-Menai, argue all of those targeted have “bad ideologies” or “keep silent” about the militants in their midst. Khaled belongs to a wealthy, important family of the el-Menai tribe, one of the most powerful in North Sinai (the same tribe Shadi el-Menai belongs to). Militants killed his father, Sheikh Khalaf el-Menai, and one of his brothers last year, allegedly for cooperating with the authorities. Another brother, Suleiman Khalaf el-Menai, was reportedly killed by militants in October. In December 2012, the government banned - in Law 203 - the private ownership, rental and use of nearly all land within 5km west of the border, with the exception of the border town of Rafah. At the time, the army said the decree was designed to help the government cope with threats to Egypt’s national security on its eastern borders. Beshadi says the armed forces’ current aim is to create 1km-wide empty zone, where “it will be easy to fight terrorists”. “Egyptian security is a priority,” Ali said. “You cannot have your house on the border line and prevent us from seeing threats clearly.” He said residents living within 1km of the border would be compensated for the destruction of their homes. Some affected people have contacted local human rights groups, but few are optimistic about accountability on the authorities’ side. At the beginning of October, defence minister and de facto leader of Egypt Abdel Fattah al-Sisi thanked Sinai's residents “for their patriotic role” and apologized: "We undertake procedures that may be inconveniencing them, and we promise to compensate them for [damaged] land or buildings that collapsed." Also in the series Sinai: Destined to suffer?